Any exhibition on the wealth of a nation’s royal class is an exhibition of the inflated amour-propre of men with money and armies at their beck. Well-fed bluebloods wrap themselves in theater curtains, pile on the baubles, and commission royal portraits for which they assume expressions of such preposterous self-importance as to nullify any trace of human dignity. It’s a recurring expression, too; you see it in the portraits of Henry VIII, the Florentine dukes of the Renaissance, and Rigaud’s portraits of the Sun King. Add to the club the princes on display in the Victoria and Albert’s import to the Asian Art Museum, Maharaja: The Splendor of India’s Royal Courts. It’s not that there aren’t objects of great beauty or fascination in the Maharaja exhibit, and it’s not that you won’t learn anything if you’re in the market for a (superficial) lesson in Indian history. But troubling is that this display of ostentation is treated without a hint of irony. Maharajas (from “mahant rajan,” or “great king” in Sanskrit) are discussed in noncommittal terms of their duties as rulers — your usual, “protect, serve and patronize the arts” — no talk of how they did that. When considering an exhibition of 300 years of conspicuous consumption on a scale to make Russian gas oligarchs blush, the questions that come to mind are, “Where did all that money come from? What tactics did he use to levy taxes? How did he keep from getting his throat sliced open? Who made these jewels, and what were the conditions in the mines? 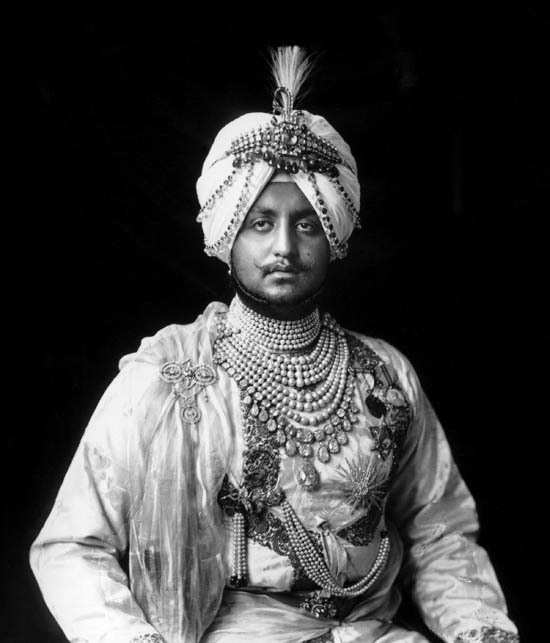 What was the punishment for speaking out against the maharaja?” Basically, “At what cost, this extravagance?” Nothing. Some of the paintings depict a king atop a magnificently jeweled elephant (the ceremonial elephants are draped with what is called a jhool), and his subjects, in what is described as Darshan, the “dynamic exchange of seeing and being seen by a superior being.” In the magnificence of their humility, the kings borrowed this notion from a Hindu one that says a deity, in revealing himself, bestows grace upon his followers, who in turn are made receptive to this grace by seeing him. This entry was posted in painting, REVIEWS, San Francisco and tagged ART, Asian Art Museum, India, INdian art, museums, raj, REVIEWS, San Franciaco, Victoria & Albert Museum. Bookmark the permalink.